Determination of tubeimoside I content in Bolbostemma paniculatum (Maxim.) Franquet and its anti-proliferative effect on human erythroleukemia K562 cells. To establish a method for determining tubeimoside I content in Bolbostemma paniculatum (Maxim.) Franquet; and to investigate the anti-proliferative mechanisms of tubeimoside I on K562 cells. HPLC was employed. Column: RP-C18 (4.6 × 250 mm 5 μm); mobile phase: methanol-water (V:V=68:32); DAD detection wavelength: 214 nm; temperature: room temperature. Effect of tubeimoside I on K562 cell proliferation was determined by MTT assay; and apoptosis rate was measured by flow cytometry. Tubeimoside I exhibited linearity within a 0.408-2.040 mg/mL range (r=0.9996). Average recovery was 98.98% (n=5), with RSD=1.82%. MTT assay showed that treatment with different doses of tubeimoside I for 12 and 24 h could all reduce the viability of K562 cells. Flow cytometry with PI staining revealed that tubeimoside I could induce K562 cell apoptosis within the test concentration range. Compared to the control group, apoptosis was positively correlated with drug concentrations, showing marked dosedependence. The present method is rapid, simple and accurate, which can be used for determining tubeimoside I contents in Bolbostemma paniculatum (Maxim.) Franquet and its preparations. Tubeimoside I has an anti-proliferative effect on K562 cells. Tubeimoside I, HPLC, K562 cell, Apoptosis, Flow cytometry. Tubeimu, also known as Tubei, Dabeimu, Dikudan and Caobei, is the bulb of cucurbitaceous plant Bolbostemma paniculatum (Maximum) Franquet, which is mainly produced in Henan, Shaanxi and Shandong. Originally recorded in the Supplement to Compendium of Materia Medica, the herb has heat-clearing, phlegm-dissipating, lump-resolving and toxicity-eliminating functions, which is mainly used for acute mastitis, scrofula, subcutaneous nodules, sores, boils, warts, snake and insect bites, etc. According to the studies on extraction, isolation and identification of Bolbostemma paniculatum (Maximum) Franquet done by domestic and foreign scholars, the herb contains the following categories of constituents: First category is saponins, including tubeimoside I, tubeimoside II, tubeimoside III, tubeimoside IV, tubeimoside V, etc., which are the main active constituents of the herb; second category is sterols and their glycosides and esters; third category is heterocyclic compounds; fourth category is organic acids; and fifth category is saccharides [1-6]. Modern pharmacological studies have demonstrated the pronounced pharmacological activities of multiple constituents in Bolbostemma paniculatum (Maxim.) Franquet, such as anticancer, antiviral, anti-inflammatory, immunosuppressive and spermicidal properties [7-10]. Hu Zhang examined the effect of tubeimoside I on HL-60 cell growth using MTT assay and flow cytometry, and found that tubeimoside I could effectively inhibit HL-60 cell differentiation and arrest cell growth, with a certain dose-effect relationship under experimental conditions [11,12]. Tubeimoside I can also down-regulate c-myc expression and up-regulate c-fos expression in K562 cells and induce their hemoglobin production and differentiation into mature erythroid cells. These indicate that the active constituents of Bolbostemma paniculatum (Maximum) Franquet have growth inhibitory effects on HL-60 and erythroleukemia K562 cells. This paper systematically studies the quality standards of tubeimoside I and investigates its inhibitory effect on human erythroleukemia K562 cell growth. CO2 incubator (NBS, USA), flow cytometer (BECKMAN-COULTER, USA), RPMI 1640 (Gibco), MTT (Sigma), FBS (Hangzhou Sijiqing Biologics), 1260 HPLC system (Agilent), 1260 DAD detector (Agilent), HPLC grade reagents. Tubeimoside I, with a purity of over 96%, was self-extracted. Human erythroleukemia K562 cell lines were provided by the China Medical University. Column: RP-C18 (4.6 × 250 mm 5 um); mobile phase: methanol-water (V:V=68:32); DAD detection wavelength: 214 nm; temperature: room temperature. Reference solution: Appropriate amount of tubeimoside I reference was accurately weighed and added with the mobile phase to prepare a 0.816 mg/mL stock reference solution. 0.5, 1.0, 1.5, 2.0 and 2.5 mL of the stock reference solution were then accurately drawn to prepare 0.408, 0.816, 1.224, 1.632 and 2.040 mg/mL reference solutions. Linear range: Each 20 μl of reference solutions under "2.2.1" was accurately drawn and chromatographed according to the above conditions. Standard curves were plotted with peak area Y as the ordinate and reference concentration X(mg/ml) as the abscissa. Regression equation: Y=0.923X-0.014, r=0.9996 (n=5). Linear range was 0.408-2.040 mg/ml (Figure 1). Sample solutions were taken and determined separately at 0, 2, 4, 8, 12 and 24 h. The results showed that the RSD of tubeimoside I was 0.42% within 0-24 h, indicating good stability within 24 h.
Each 10 μl of reference solutions was injected 5 consecutive times to measure the resulting chromatographic peak areas. RSD was found to be 2.1%. 0.2 g of known tubeimoside I extract was accurately weighed, added with an appropriate amount of reference and determined according to the above conditions. The results showed that the average recovery was 98.98% (n=5), with RSD=1.82%. Five aliquots of samples from the same batch were accurately weighed and prepared as per the method for preparation of sample solution. Then, each 20 μL of the above solutions was accurately drawn and determined under the same chromatographic conditions. RSD was found to be 1.4 (n=5), indicating good reproducibility of the method. Cell culturing: K562 cell lines were routinely subcultured in a 37, 5% CO2 incubator with 10% FBS-containing RPMI 1640 medium. Logarithmic phase cells were collected for experimental use. Logarithmic phase cells were digested with 0.25% trypsin, prepared into a 2 × 105 cells∙ml-1 suspension, seeded into 96- well plates and treated with different concentrations (20, 40, 80 and 120 μg/l) of tubeimoside I. Five replicate wells were set up for each concentration. 12 and 24 h later, 20 μl of MTT solution (5 gl-1) was added to each well and the incubation was continued for an additional 4 h. Then, supernatant was discarded, each well was added with 100 μl of DMSO and shaken for 10 min, followed by measurement of A value of each well at 550 nm with a microplate reader. Inhibition rate=(A value of negative control group - A value of treatment group) / A value of negative control group×100%. Experimental results showed that treatment with different doses of tubeimoside I for 12 and 24 h could all reduce the viability of K562 cells. Cell viability decreased continuously with increasing dose. At the same concentration, cell viability decreased continuously over time. The differences were statistically significant compared to the control group (Figure 2). 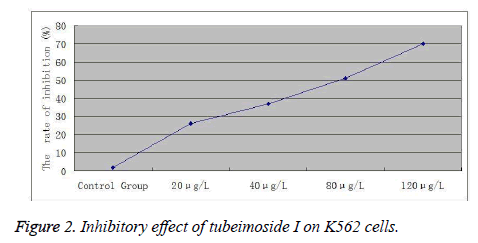 Figure 2: Inhibitory effect of tubeimoside I on K562 cells. K562 cells treated for 24 h in the different drug concentration groups and the control group were collected separately, uniformly scattered, washed twice in PBS, mixed uniformly with an appropriate amount of PBS buffer and PI/RNase staining buffer for 30 min, then passed through a 4-mesh sieve and analyzed for cell cycle on flow cytometer. The results are shown in Table 1. Flow cytometry with PI staining revealed that tubeimoside I could induce K562 cell apoptosis within the test concentration range. Compared to the control group, apoptosis was positively correlated with drug concentrations, showing marked dose-dependence. Tubeimoside I could increase the proportion of G0/G1 phase cells and reduce the proportion of S phase cells within a 20-80 μg/l range. Differences between groups were all significant. With the increase in drug concentration, the effect also became increasingly prominent. *p<0.05, **p<0.01, compared with control group. Table 1: Effect of tubeimoside I on cell cycle of K562 cells (n=6, ± s). In 1972, Kerr proposed, for the first time, the concept of cell apoptosis. He claimed that apoptosis was a process of initiative cell death under gene regulation, which was an important mechanism for maintenance of homeostasis. Currently, mechanisms of apoptosis are not fully understood yet. Development and progression of apoptosis are divided into three stages: signal transfer stage, central regulation stage and structural change stage. Both apoptosis and proliferation are the basic phenomena of life and the basic measures for maintaining the dynamic equilibrium in the number of cells in the body. In adulthood, senescent and diseased cells are cleared through apoptosis to ensure the health of the body. Similar to the cell proliferation, apoptosis is also a precise process regulated by genes. Induction of tumor cell apoptosis is a new approach to the oncotherapy research. Its essential feature is induction of tumor cell apoptosis, that is, the purpose of tumor treatment is achieved through the induction of apoptosis in respective sensitive tumor cells. The results of this study demonstrate that treatment with different doses of tubeimoside I for 12 and 24 h can all reduce the viability of K562 cells. Cell viability decreases continuously with increasing dose. At the same concentration, cell viability decreases continuously over time. The differences are statistically significant compared to the control group. Flow cytometry with PI staining reveals that tubeimoside I can induce apoptosis in K562 cells within the test concentration range. Compared to the control group, apoptosis is positively correlated with drug concentrations, showing marked dose-dependence. Each treatment group can significantly increase the G0/G1 and G2/M phase concentrations compared to the control group, showing marked dose-effect relationship with increasing concentration of tubeimoside I. This suggests that with prolonging action of tubeimoside I, the drug is gradually broken down and metabolized by cells to markedly inhibit cell differentiation, thus ultimately inducing tumor cell apoptosis. Jin PF, Zheng CH, Pei YH. Advances in the research of Bolbostemma paniculatum (Maxim.) Franquet. Journal of Shenyang Pharmaceutical University 2003; 20: 152-156. Tang HF, Yi YH, Zhang SY, Sun P, Li L, Zhou DZ. A New Cyclic Bisdesmoside from Tubers of Bolbostemma paniculatum. Chinese Chemical Letters 2005; 6: 479-482. Liu WY, Zhang WD, Chen HS, Gu ZB, Li TZ, Chen WS. New triterpenoid saponins from Bulbs of Bolbostemma Paniculatum. Paniculatum. PlantaMed 2004; 70: 458-464. Ma TJ, Li J, Tu PF, Lv FJ. A novel triterpenoid saponin from bulbs of Bolbostemma paniculatum. Chinese Traditional and Herbal Drugs 2006; 37: 327-329. Liu WY, Zhang WD, Chen HS, Gu ZB, Li TZ, Zhou Y. Pyrrole alkaloids from Bolbostemma paniculatum. Journal of Asian Natural Products Reseach 2003; 3: 159-163. Wang F, Ma RD, Yu LJ. Role of Mitochondria and mitochondrial cytochrome C in tubeimoside Ñ-mediated apoptosisofhuman cervical carcinoma Hela cell line. Cancer Chemother Pharmacol 2006; 57: 389-399. Yu TX, Ma RD, Yu LJ. Structure-Activity Relationship of Tubeimosides in AntiInflammatory, Antitumor, and Antitumor-Promoting Effects. Acta Pharmacol Sin 2001; 22: 463-468. Yu C, Qiu ZY, Tang WX. Effects of tubeimosides on apoptosis and morphology of SW480 cells. Chinese Pharmacological Bulletin 2006; 22: 154-158. Cheng G, Zhang Y, Zhang X, Tang HF, Cao WD, Gao DK, Wang XL. Tubeimoside V (1), a new cyclic bisdesmoside from tubers of Bolbostemma paniculatum,functions by inducing apoptosis in human glioblastoma U87MG cells. Bioorganic & Medicinal Chemistry Letters 2006; 16: 4575-4580. Ma RD, Song G, You WB, Yu LJ, Su WM, Liao MN, Zhang YP, Huang LZ, Zhang XY, Yu TX. Anti-microtubule activity of tubeimoside I and its colchicine binding site of tubulin. Cancer Chemotherapy and Pharmacology 2008; 62: 559-568. Hu Z, Ma RD, Yu LJ. Effects of tubeimoside I on cell cycle and apoptosis of human myeloblastic leukemia cells HL-60. Chinese Journal of Clinical Oncology 2003; 30: 163-166. Liu JY, Gao Y, Yu LJ. Differentiation-inducing activity of tubeimoside I in human erythroleukemia K562 cells. Chinese Journal of Clinical Pharmacology and Therapeutics 2006; 11: 43-58.